Whose poster hung on your wall as a teenager? Whose record did you wear out? Whose life story could you not resist? Fascination works in mysterious ways--it can be born out of inspiration, or repulsion, or both. 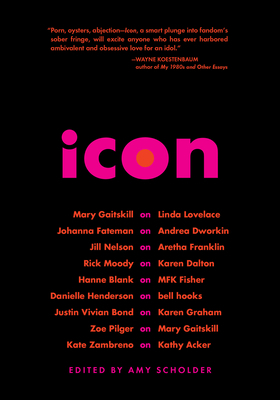 In these daring essays, some of the most provocative writers of our time offer a private view on a public figure. In the process, they reveal themselves in beautiful and unexpected ways, blurring the line between biography and memoir. Amy Scholder has been editing and publishing progressive and literary books for over twenty years. Her visionary style has brought high visibility to her authors, and has been praised for its contribution to contemporary literature and popular culture. She has served as editorial director of the Feminist Press, editor-in-chief of Seven Stories Press, US publisher of Verso, founding co-editor of HIGH RISK Books/Serpent's Tail, and editor at City Lights Books. Over the years, she has published the work of Sapphire, Karen Finley, June Jordan, Kate Bornstein, Kathy Acker, David Wojnarowicz, Dorothy Allison, Mary Gaitskill, Joni Mitchell, Kate Millett, Elfriede Jelinek, Muriel Rukeyser, Laurie Weeks, Justin Vivian Bond, Virginie Despentes, Ana Castillo, and many other award-winning authors.